This book of essays certainly DOES contain recipes. They are just not listed in a traditional manner. They are found within the essays. Back in print! 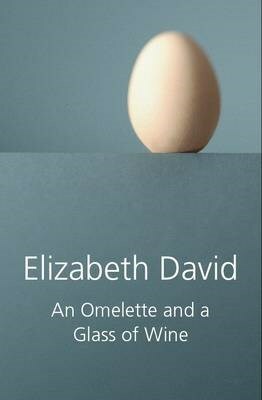 An Omelette and a Glass of Wine, offers 62 articles originally written by Elizabeth David between 1955 and 1984 for numerous publications including The Spectator, Gourmet magazine, Vogue, and The Sunday Times. This revered classic volume contains delightful explorations of food and cooking, among which are the collection's namesake essay and other such gems as Syllabubs and Fruit Fools, Sweet Vegetables, Soft Wine, Pleasing Cheeses, and Whisky in the Kitchen. Her subjects range from the story of how her own cookery writing began to accounts of some restaurants in provincial France, of white truffles in Piedmont, wild risottos on the islands of the Venetian lagoon and odd happenings during rain-drenched seaside holidays in the British Isles. Here we can share her appreciation of books, people who influenced her, places she loved and the delicious meals she enjoyed. Some of the best essays are those about others who wrote about food such as Norman Douglas and Mrs Beeton. She writes so vividly that we can see, taste and even smell the dishes she describes. Many of these pieces, such as ‘I'll Be with You in the Squeezing of a Lemon,’ from 1969--about cooking with lemons--barely show their age. But even if they did, you wouldn't care, because of the rich store of information that David shares and the literary grace with which she imparts it. Some articles include recipes, but for the most part this is a volume nicely sized to curl up with or to take on a trip. Articles, book reviews and travel pieces, they will be new to many of her readers and a delight to all for their highly personal flavor. Jane Grigson praised it for including all the dishes most closely associated with her, Spiced Beef, Salted Welsh Duck, and Syllabub. Her many admirers will cherish this new hardcover edition for its 320 high quality pages interspersed with charming black and white illustrations and some photographs.